The town of Aviemore has existed since at least as far back as the 1600s, but it didn't really begin to grow until the latter part of the 1800s with the arrival of the railway. The first line was built in 1862, and by 1892 it was an important junction with lines to Perth, Inverness and Forres. Hotels followed, and though the phrase was to take a while to catch on, Aviemore started its evolution into a mountain resort. The second major period of growth followed the development of the Cairn Gorm ski areas from 1961. This led in 1964 to the Aviemore Centre, providing a wide range of services for visitors and residents alike. Unfortunately, Scottish architecture in the 1960s tended to view concrete as the ultimate answer to life, the universe, and everything. As a result, what emerged in Aviemore seemed more than a little reminiscent of the sorts of structures going up in peripheral estates around Scotland's larger cities at the time. 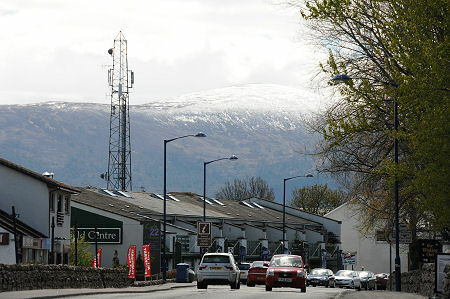 Aviemore has spent much of the intervening four decades trying to live down the reputation given it by the Aviemore Centre. And at the start of the third millennium it's time to acknowledge that things are changing for the better. Most of today's Aviemore really does look and feel much better designed and cared for than yesterday's ever could. Despite this, although housing development has continued apace on the north side of the town and to the west of the A9, there remain areas closer to the centre where development does appear to have stalled: or, perhaps, is simply awaiting a kinder economic environment. Today's Aviemore has all the services you'd expect of the main town serving a very large area, plus the theatre, swimming pool, dry ski slope, and go-karting track you might not expect. 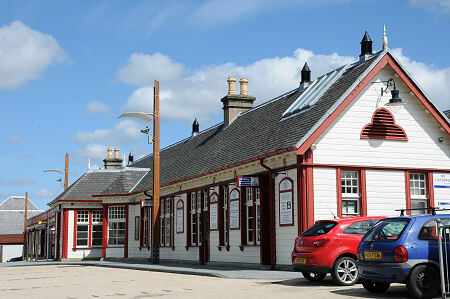 The town still has a railway station on the main Perth to Inverness line, and for enthusiasts and visitors, steam trains of the Strathspey Railway run a regular service on a restored branch line from Aviemore to Boat of Garten and beyond. Closely following the route of the restored line is the southern end of the Speyside Way. This long distance path opened in 2000 and now links Aviemore with Buckie on the north east coast. 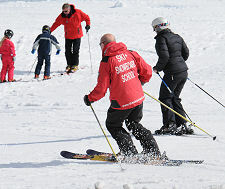 The focus of Aviemore's recent development continues to lie with the Cairn Gorm ski area, eight miles into the mountains that form the south east skyline for the town. In the early years of the current century the Cairn Gorm ski area saw major developments with the building of the CairnGorm Mountain Railway, a replacement for the old chairlifts. This continuing development as a year-round resort helps explain the very large choice of accommodation available in Aviemore, from the large and traditional to the large and modern, and taking in a wide range of smaller hotels, guest houses, B&Bs, hostels and camping and caravan facilities; plus a large amount of self catering accommodation. You can read our review of the popular Hilton Coylumbridge Hotel here. Aviemore also offers plenty of shopping opportunities, many in recently facelifted and refreshed shops. If you are looking for a supermarket you will find one. If you want outdoor or skiing clothing or equipment, you will find plenty to choose from. And you will also find no shortage of shops appealing to passing tourists. At the southern end of the town is St Aidan's RC Church, and the Aviemore also has a Church of Scotland Church.